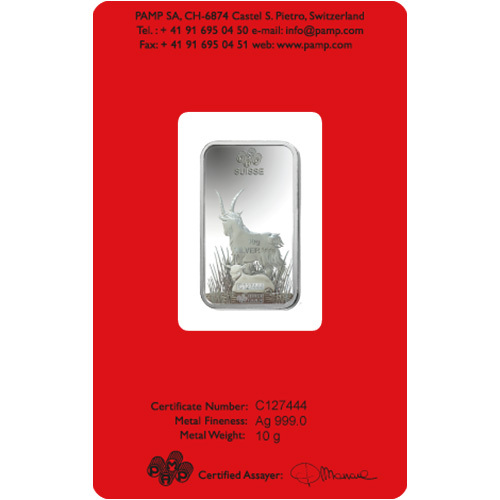 The Year of the Goat silver bar design from PAMP Suisse was the first in the collection to feature two of the same animal on it. While previous releases, and the subsequent Monkey and Rooster bars, had just one animal from different angles, the PAMP Suisse Lunar Goat offered two versions of the same design. Right now, 10 Gram Silver PAMP Suisse Lunar Goat Bars are available to purchase online at Silver.com. Ships to you inside of protective plastic packaging with an included Assay card! Issued for the Year of the Goat in 2015! The obverse of the bar features an adult goat standing in front of a bush. The reverse face shows you more of the scene with a young lamb behind the bush. 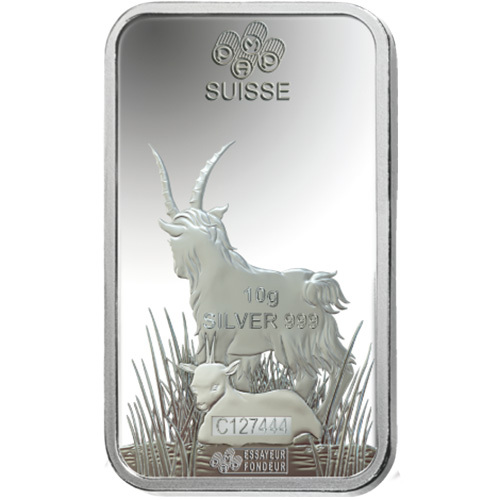 Each 10 Gram Silver PAMP Suisse Lunar Goat Bar in this listing is available to you with individual protective packaging. PAMP Suisse packages each bar inside of protective plastic and seals the package with its CertiPAMP Assay card. This assay card provides matching information on the bar’s weight, purity, metal content, and serial number that allow you to verify its quality with PAMP. The use of red assay cards in the Lunar Collection silver bars is done on purpose. It is customary at the Chinese New Year to exchange money as a sign of good luck and fortune for the year ahead, and that money is often gifted to others inside of red envelopes. For the Year of the got release in this collection, PAMP Suisse rolled out a new design concept that followed the front-back visuals of previous issues, while introducing more to the eye for the reverse design. On the obverse of 10 Gram Silver PAMP Suisse Lunar Goat Bars is the image of an adult goat with tall, relatively straight horns standing in front of a bush. The engraving of the word goat from the Chinese language is found at the top of the design field. Flip it over to the reverse of the 10 Gram Silver Lunar Goat Bar, and you’ll find more to this scene than initially divulged. Here, you’ll see the back of that adult goat while noticing that there is a small lamb laying in the bushes that was not visible in the obverse design element. This side of the bar has the markings of weight, purity, metal content, and an individual serial number. If you have any questions about silver bars for sale, please contact Silver.com. Our customer service team is available to you at 888-989-7223, online using our live chat, and via our email address.